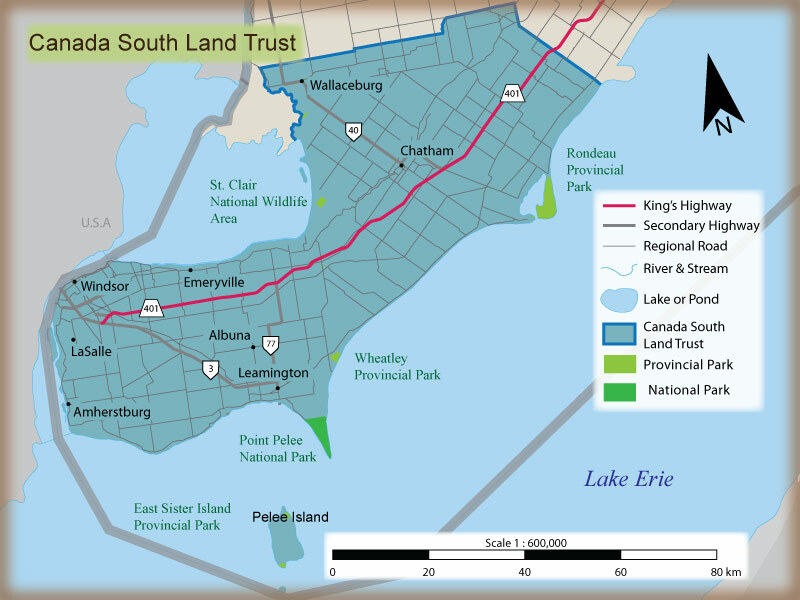 The Canada South Land Trust was established to preserve natural areas within Southwestern Ontario in the City of Windsor, Essex County, Pelee Island and the Municipality of Chatham-Kent for future generations. Environment Canada has developed the Ecological Gifts Program which guides how a land trust proceeds in order to accept an interest in land or accept a gift of land which has been identified as a ecologically significant. If the land trust accepts a donation of interest in ecologically significant lands, this type of donation is referred to as a “Conservation Easement Agreement.” Landowners who donate an interest in their lands receive an income tax receipt which reflects the appraised value of their donation. Landowners who chose to donate a Conservation Easement Agreement with regard to their lands are concerned about the long term care of their significant natural area. An income tax receipt is not always top priority to landowners who want assurance that restrictions are in place on their natural area, ensuring its long term care. Other landowners may wish to donate their land with ownership transferred to the land trust. As with a Conservation Easement Agreement, the landowners receive an income tax receipt with reflects the appraised value of the lands. On page 4, the Handbook provides more information about the Ecological Gifts Program: “Habitat loss and degradation are the greatest threats to biodiversity in Canada today. Many key habitats – from marshes to grasslands – are found on private property and therefore landowners play a vital role in their conservation. Canada’s Ecological Gifts Program provides a way for Canadians who own ecologically sensitive land to protect nature and leave a legacy for future generations. Made possible by the provisions of the Income Tax Act of Canada, the program offers significant tax benefits to landowners who donate land, or an eligible interest or right in the land, to a qualified recipient. Outside of the Province of Quebec, eligible interests in land are constituted of covenants or conservation easements and can be donated to the program. The eligible right in land considered by the Ecological Gifts Program for a donation in the Province of Quebec is a real servitude. Recipients ensure that the land’s biodiversity and environmental heritage are conserved in perpetuity. The Ecological Gifts Program is administered by Environment Canada in cooperation with numerous partners, including other federal departments, provincial and municipal governments, and environmental non-government organizations such as the Canada South Land Trust. As a result of this collaborative approach and a dedication to improving the program on an ongoing basis, the Ecological Gifts Program continues to provide a means of securing private land for conservation every year. Since its inception in 1995, hundreds of Canadians have made ecological gifts valued at a total of more than $550 million. Many of these ecological gifts contain habitats designated as having national, provincial or regional importance, and many include rare or threatened habitats that are home to species at risk.